Barcelona becomes a city of Festivals every summer; but one of the most varied and eagerly awaited is the one known now simply as ‘El Grec’ – the Greek. Although the spectacular bowl-like auditorium of the Greek Theatre itself, on the northern edges of Montjuic, was built in 1929 for the city’s World Fair the actual festival named after it has been established only since 1976. 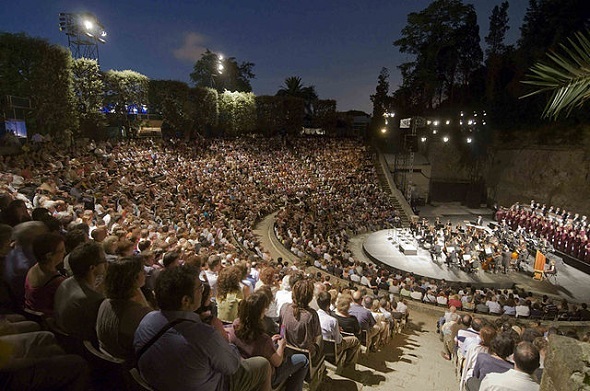 Originally purely a theatrical event and confined solely to the Greek Theatre, El Grec now encompasses theatre, music, dance, flamenco, film and even the circus has a place. Indeed the spectacular Circus Night is one of the highlights of the year for many seasoned festival-goers with acrobats, jugglers, musicians and people who just don’t fit into a category all providing a memorable evening. In 1979 the Festival came under the aegis of the Barcelona authorities who saw it as an ideal opportunity to expand El Grec with both Catalan and international productions. It soon became recognised as one of Europe’s leading multidisciplinary cultural festivals. Beginning at the end of June and lasting all the way through to the early days of August the number of venues has increased in accordance with the Festival’s expansion. The superb setting of the Greek amphitheatre is still at the heart of numerous events but it has been joined by many of the city’s other most prestigious performance areas. Accordingly the Palau de la Música, the Fundació Joan Miró, the Caixa Forum, the Teatre Lliure and the Plaça del Rei now play host to concerts and other events; all of them in the evenings and many of them outdoors. Over the five weeks of the festival there are now more than 50 separate elements of El Grec’s varied programme many involving leading performers and companies from around the world. Whether you are searching for jazz, Latin, modern or classical music and theatre, contemporary, sometimes controversial offerings or simply world class performers in one of the world’s great city’s El Grec will have something to offer. Some of the events are free of charge and prices of the others will vary considerably. Tickets for the performances are on general sale from the May of the year of the Festival. Full details can be found on the El Grec website although at some times of the year it is available only in Catalan. Once the programme is announced an English version is available at Barcelona Summer Festival. Alternatively, tickets can be booked through Telentrada either by telephone at 00 34 902 101 212 or on-line at www.telentrada.com. Many people don’t need much of an excuse to visit Barcelona. It is one of Europe’s most vibrant and colourful cities – a place of stunning, varied architecture, exciting night-life and fabulous beaches. The Barcelona Summer Festival, El Grec, brings something additional even to this cultural melting pot. Getting to the Catalan capital city has never been easier. Most ‘no frills’ or budget airlines fly regularly either to the main Barcelona El Prat airport or to nearby Girona and Reus. In addition, the high speed AVE train from Madrid and the improved motorway links have opened up the city to other forms of transport. And this expansion of transport possibilities has been matched by increased accommodation in Barcelona which is as varied as you’ll find anywhere in the world. If you’re a lover of great culture and a lover of the world’s great cities then a visit to the El Grec Summer Festival of Barcelona gives you a wonderful opportunity to sample both.